This swag measures approximately 14″ wide and 28″ tall. Here, it’s pictured on a 32″ door for scale. Swags are an awesome alternative for narrower doors, double doors, or even “regular” doors if you want to be just a l’il bit different. This beauty has an unusual color palette that’s so on point this year — rose gold! 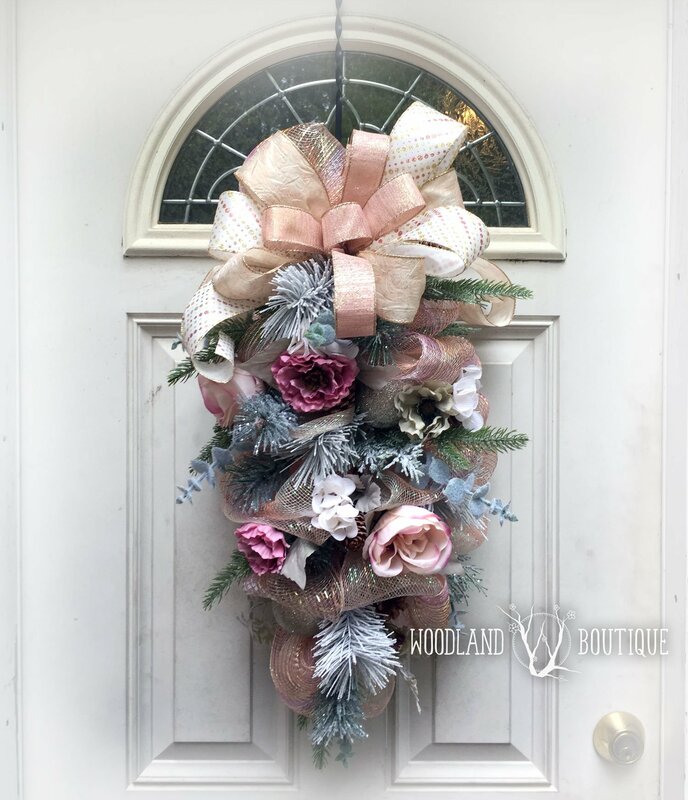 Plus, snow-covered branches, sparkly ornaments, flowers and an expertly-coordinated hand tied bow to top it off beautifully. Use this on a door, or a lightpost, or get both and flank your front door, a painting over a fireplace, a picture window, a china cabinet… ahhhh, so many possibilities! This swag measures approximately 14″ wide and 28″ tall. Here, it’s pictured on a 32″ door for scale. Only 2 are available (buy both if you want a matching set), but other color schemes are available upon request. Message me to discuss your color options. This is a made to order item, please allow up to 1 week for your swag(s) to be made and ready for pickup. In some cases, floral or greenery may be substituted with a comparable item depending on currently-available inventory, and flower position may vary from what is shown. Note: This is a handmade creation which took time, sweat, perhaps a tear and possibly a glue gun burn or two. 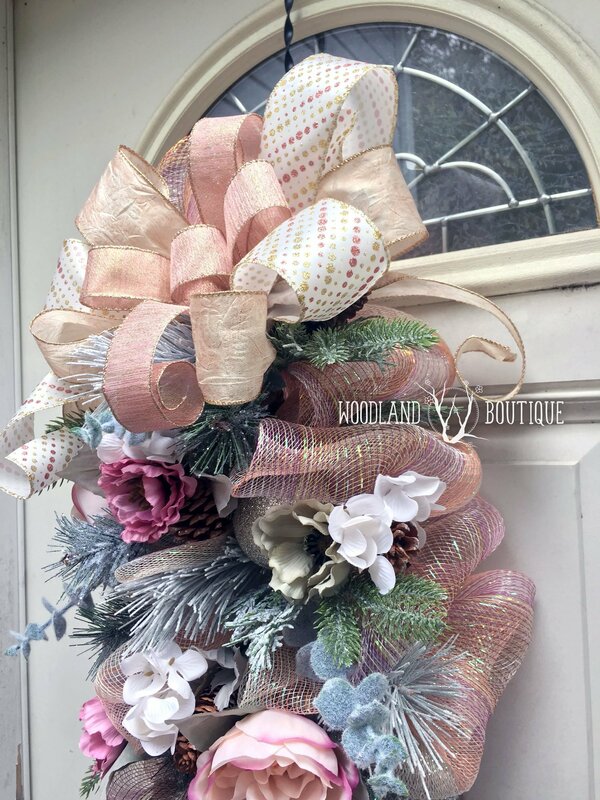 🙂 Because of this, this wreath is not eligible for free shipping or promotional coupons (however local pickup from Silver Spring, MD is always free). 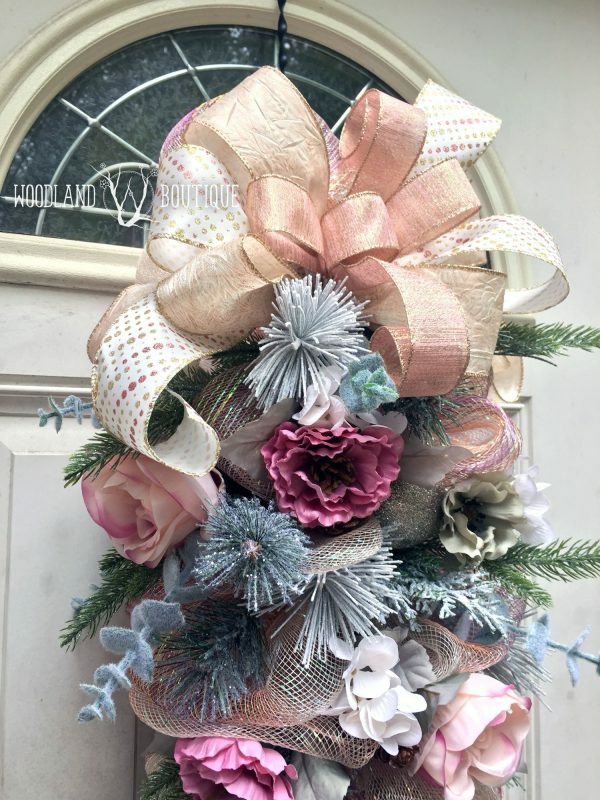 Care and feeding of your wreath: Your wreath is well-adapted to indoor use, or covered outdoor use. The premium faux florals and greenery sure do look life-like, but require remarkably little care. To preserve it’s beauty, please keep it out of the rain and avoid prolonged exposure to the sun. Free local pickup available for all MD, VA, and DC peeps from the following locations: - Four Corners/Silver Spring - College Park/Riverdale - Research Blvd in Rockville. After you place you’re order, we will figure out what works best to get your lovely creation to you. You may also choose to ship for the price quoted in the online shopping cart.